New York shield with MUTCD fonts. U. S. shield, with 1948 MUTCD fonts. This style of sign was used at important intersections, while the smaller cutout markers were retained for confirmation and reassurance. 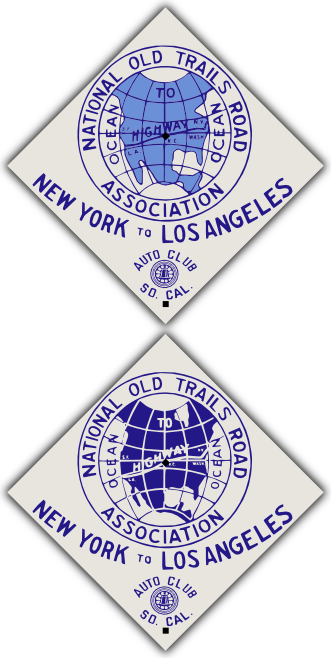 This style of guide sign was placed by the Auto Club of Southern California along the Lincoln Highway. It was used from around 1913 to 1929. The sign is 15 by 25 inches. It is porcelain enamel on steel, just like classic signs were made back in the day. Customized to your specifications, with old auto trail names, destinations (including old ghost towns), and mileages all meticulously researched. All fonts, layouts, and colors guaranteed completely accurate. This road ran from New York to Los Angeles and was a precursor to U. S. highway 66. 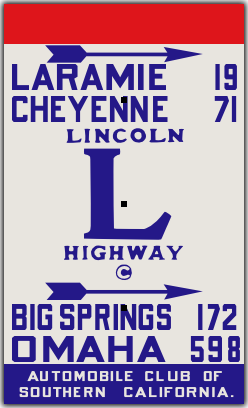 Several variants of this highway marker exist, including two- and three-colored styles asshown here. The sign is 15 inches on each diagonal side. It is porcelain enamel on steel, just like classic signs were made back in the day.